When it’s time to search for your next vehicle, don’t waste time searching other Ford dealers in Wisconsin. The only Ford dealer in Wisconsin you need to visit is right here in Cudahy WI. At Ewald’s Venus Ford, we have everything from used cars for sale to new Ford trucks for sale. Which Ford model will be right for you? Ask one of our knowledgeable sales team members at your local Ewald’s Ford dealership near you. We have a sales team that is ready to answer any questions you may have on our large variety of Ford models. Including new and used Ford trucks for sale. As well as answering questions about our finance offers and lease deals on the Ford truck that catches your eye. We are committed to providing you with exceptional customer service and an outstanding selection of Ford trucks for sale. We have many makes, models, and body styles of new and used Ford trucks for sale. We do our best to make it easy for you to find a Ford truck that best suits your style and your budget. If you are looking for power and style, we have the truck for you. Like the Ford F-150 Shelby truck for sale. The impressive new Ford Shelby truck for sale is full of features both inside and out that you will not want to miss. Like the Shelby performance tuned engine that puts out an incredible 755 horsepower. Or the BDS suspension lift and BFG all-terrain tires on this Shelby F-150. The exterior of this Ford F-150 Shelby truck is sure to be a real head-turner. And the inside of the Ford Shelby truck isn’t too bad either! Because it’s a Lariat, you will find many luxurious features. Such as keyless entry, leather heated seats, and more. Like a built-in navigation system. No more worrying about going over cell phone data when you buy this Ford Shelby truck for sale. This new Ford F-150 Shelby truck for sale also comes with many advanced safety features. Including dual-stage driver & front passenger airbags. As well as anti-lock brakes and auto-lock safety belt feature for child seats. The Ford Shelby truck for sale at Ewald’s Venus Ford also comes with auto headlamps, memory mirrors, and more. Plus, it has a rear backup camera. Back into and out of parking spaces with ease when you buy this Shelby F-150. This used Ford truck is ready to take on whatever it is you throw at it. Come to your local Ford dealer in Wisconsin at Ewald’s Venus Ford and see this new Ford F-150 Shelby for sale. 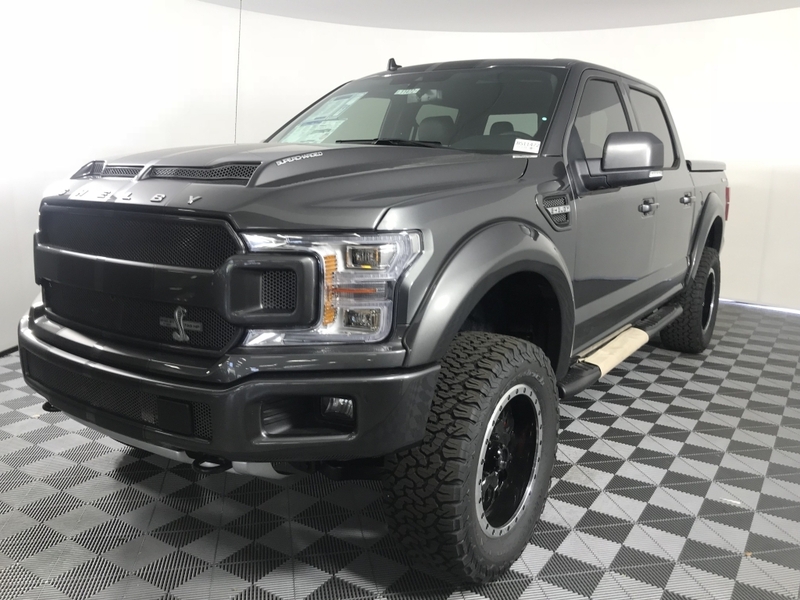 If a new Ford F-150 truck for sale, like the Ford Shelby, is not what you are after come and see one of the many other new and used trucks for sale near me. Come to Ewald’s Venus Ford your local Ford dealership in Wisconsin. Visit Ewald’s Venus Ford at 2727 E Layton Ave. Cudahy, WI 53110. Or give us to schedule an appointment at (414) 236-7442. We provide the Wisconsin areas of Cudahy, Milwaukee, Greenfield, Waukesha, and more with a great selection of new and used Trucks for sale. So, stop in today to find your next car at Ewald’s Venus Ford.